BNP has placed a six-point demand, including release of the party chairperson Khaleda Zia, for its taking part in the upcoming 11th parliamentary elections. 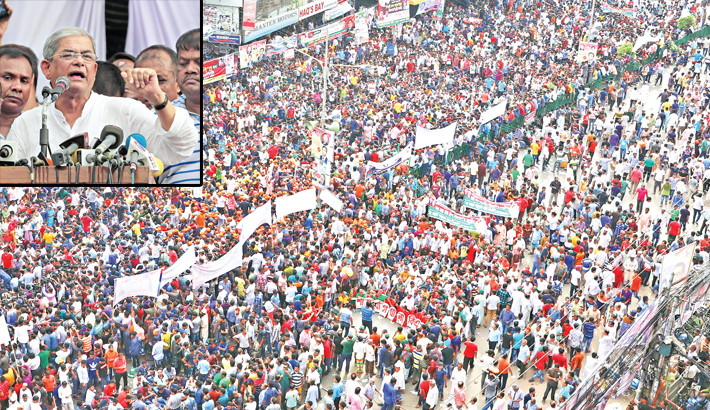 The six-point demand includes release of the party leaders and activists, including party chief Khaleda Zia, from jail, resignation of the incumbent Awami League government, dissolving current parliament, formation of an election-time neutral government, re-constitution of the Election Commission and deployment of army during polls and making a level-playing field for all political parties. The BNP leaders came up with the demands at a public rally organised by the party in front of its central office in capital’s Nayapaltan on Saturday, marking the party’s 40th founding anniversary. BNP Secretary General Mirza Fakhrul Islam Alamgir presided over the meeting. “It’s our final word that all political prisoners, including Khaleda Zia, will have to be released from jail immediately and the government has to resign before announcement of the election schedule, parliament will have to be dissolved, a level-playing field will have to be created during election, military force will have to be given responsibility to conduct the election and the election commission will have to be reconstituted,” Fakhrul said in his speech. Chanting slogan, he also demanded formation of the election-time neutral government for holding the next general election. The BNP secretary general called on the countrymen and all political organisations to get united without any delay, leaving any division to protect democracy, independence and sovereignty of the country. “We welcome those are forging unity. Come, let’s forge national unity and remove the autocrat,” he added. Mirza Fakhrul also asked the party leaders and activists to take oath to ‘free’ the country from the ‘misrule’ of the ruling Awami League government and to restore democracy. Addressing the programme as the chief guest, BNP Standing Committee Member Khandaker Mosharraf Hossain demanded release of Khaleda Zia from jail unconditionally before announcement of the election schedule, formation of election-time neutral government, making a level-playing field and resignation of the government for holding the next parliament polls. He further said the countrymen and BNP will not allow another ‘farcical’ election like that on January 5, 2014. “Without participation of BNP and Khaleda Zia, the election won’t be inclusive,” Mosharraf added. The BNP leader said now the challenge for the BNP is to free its chairperson Khaleda Zia from jail, as the government willingly will not free her. “Khaleda Zia will have to be released through movement. There’s no relation between Khaleda Zia’s release and the next parliamentary elections,” Mosharraf said. BNP standing committee member Moudud Ahmed said the only way to release Khaleda Zia from jail is take to the street as it is not possible to free her in legal process. “Movement will be waged for the release of our leader Khaleda Zia, election under a neutral government and dissolving parliament. Keeping parliament intact, election will be meaningless,” he added. BNP standing committee member Jamiruddin Sircar said Khaleda Zia will have to be released from jail as without Khaleda Zia, no election will be acceptable in the country. BNP standing committee member Mirza Abbas said the ruling party wants to come to the power through unjust way, which is conspiracy but BNP is not involved in any conspiracy. He demands immediate release of Khaleda Zia from jail and making way for Tarique Rahman to return home from London. BNP standing committee member Gayeshwar Chandra Roy said Khaleda Zia’s release from jail is inevitable. He demanded resignation of Prime Minister Sheikh Hasina and Chief Election Commissioner KM Nurul Huda. BNP standing committee member Amir Khasru Mahmud Chowdhury said keeping Khaleda Zia in jail and accusing Tarique Rahman in case no one can be saved. BNP vice-chairman Shamsuzzaman Dudu said Khaleda Zia will take the responsibility of the Prime Minister of the country within December or January and Tarique Rahman will return home at the end of January. BNP observed the day across the country with various programmes, including hoisting party flag atop party offices, holding rallies and processions and placing wreaths at the grave of Ziaur Rahman in Dhaka.